In this chapter, we first introduce the main concepts related to quasielastic neutron scattering (QENS) techniques and the way they can be connected to dielectric spectroscopy (DS). This is not obvious, because they access different correlation functions. The dielectric permittivity measured by DS reflects the orientational dynamics of the molecular dipoles in a very broad temperature/frequency range, while, thanks to the transfer of energy (\(\hbar \omega \)) and momentum (\(\hbar Q\)) dependence of the measured intensities, QENS provides information about nuclear positions with space/time resolution. In particular, QENS on protonated samples follows the self-correlation function of the hydrogens. 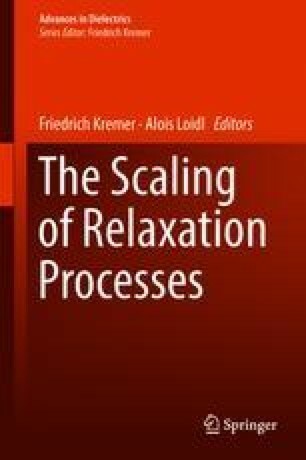 Next, we describe the general findings from both techniques relative to the \(\alpha \)-relaxation in glass-forming systems. From the comparison of the results, we define a Q-value (\(Q^\star \)) at which the timescale of the \(\alpha \)-process measured by QENS and DS become similar and compile its values from the literature for diverse systems ranging from polymers and low-molecular weight glass-forming systems to water and water solutions. The results are discussed in a phenomenological way in terms of structural and dynamic parameters. Thereafter, we show that in the case of a simple diffusive process, a simple approach based on molecular hydrodynamics and a molecular treatment of DS allows expressing \(Q^\star \) in terms of a many-body magnitude—a generalized Kirkwood parameter —and a single-molecule magnitude—the hydrodynamic radius. The application of these ideas to liquid water and water solutions is presented. Finally, we explore the possibility of extending this kind of treatment to the more complex subdiffusive case. We are indebted to our collaborators in the Polymers and Soft Matter Group in San Sebastian and at the different neutron facilities (Jülich Center for Neutron Science, Institute Laue Langevin, Paul Scherrer Institute, etc. ), who helped to shape many of the experiments we report on in this chapter. In particular, we we would like to thank Prof. Angel Alegría and Prof. Dieter Richter for helpful and lively discussions. We acknowledge financial support by the Spanish Ministry ‘Ministerio de Economia y Competitividad,’ code: MAT2015-63704-P (MINECO/FEDER, UE) and by the Basque Government IT-654-13 (GV).